I love the London Cycle Hire system (apart from the seats, that is - there's a special level of hell for whoever designed those modern-day implements of torture. Maybe they are specifically designed to be unbearable for longer than 30 minutes. But I digress). I love the system, but I am not a Londoner. I can find my way from Waterloo to Westminster if the sun is out, but that's about it. Anything else, I need a map. This is where cycling in London gets 'hard'. Being asked to navigate *and* avoid Addison Lee drivers / tipper trucks / TfL buses is just asking far too much. And the mostly-random street pattern makes a mockery of trying to 'cache' your route brainwise. So you need a map. I'm a big fan of Google Maps. It just works. There are various other options - iOS maps, various cycling apps - but GMaps is free and - importantly, as you will see - works in landscape mode. But the map app is only half the equation. The other part is - how do you follow it? You can pop in some headphones and listen to directions, but that's not foolproof as it relies on the app's interpretation into your language of its own route. And many drivers get aggro because you're another scofflaw cyclist with zero respect for others let alone your own wellbeing and therefore deserve running into the gutter. (note there is no law against cycling with headphones). Or you can pull over and stop at every single intersection, fish your phone out, unlock it, open the app, check the next turn, try to remember a few more, put phone away, check, signal, pull out and crack on. Faff. Broken cycling vibe. Further 0 -> 10MPH interaction with London's courteous and cyclist-conscious drivers. 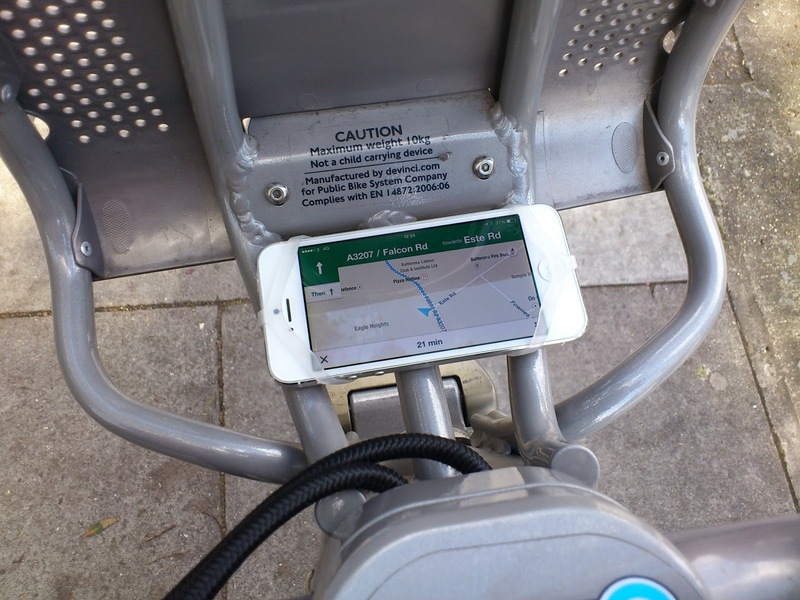 So how can you safely SEE the map, on a rental bike, without risking your phone getting nicked or falling off? Enter the Finn mount - previously reviewed in detail here. 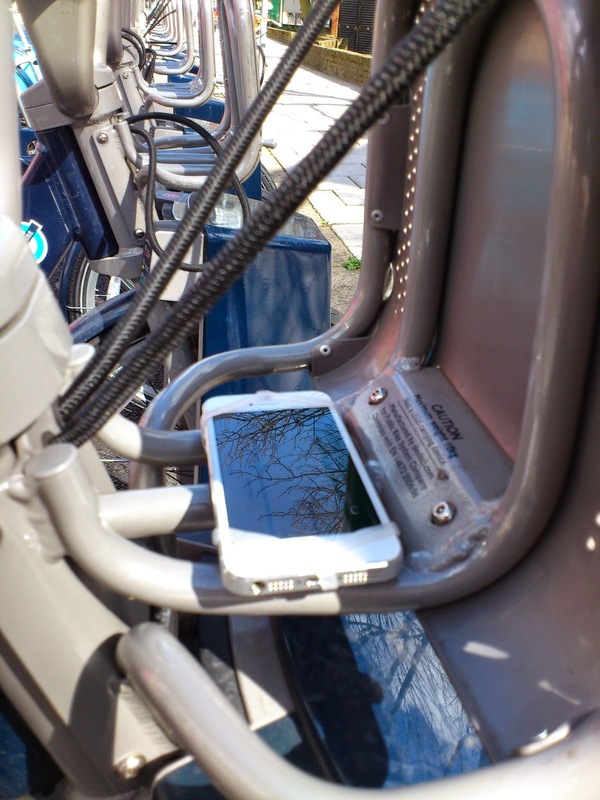 Borisbikes have a custom-designed smartphone mounting and protection system, cunningly disguised as a bag carrier. The Finn mount wraps perfectly around the middle bar, with the two outer bars then holding your phone perfectly flat, the silicon rubber straps providing vibration damping and silencing any rattles. That's about it. The phone is then totally secure. It's not going anywhere. You can glance down to see where you are going, and if you enable voice guidance the audio prompts are surprisingly loud - maybe the front panel helps. Even in bright sunlight the screen remains visible, again helped by the proximity of lots of metal. The chance of a n'e'er-do-well seeing your phone and grabbing it is greatly reduced over a normal handlebar mount that's out for all to see. 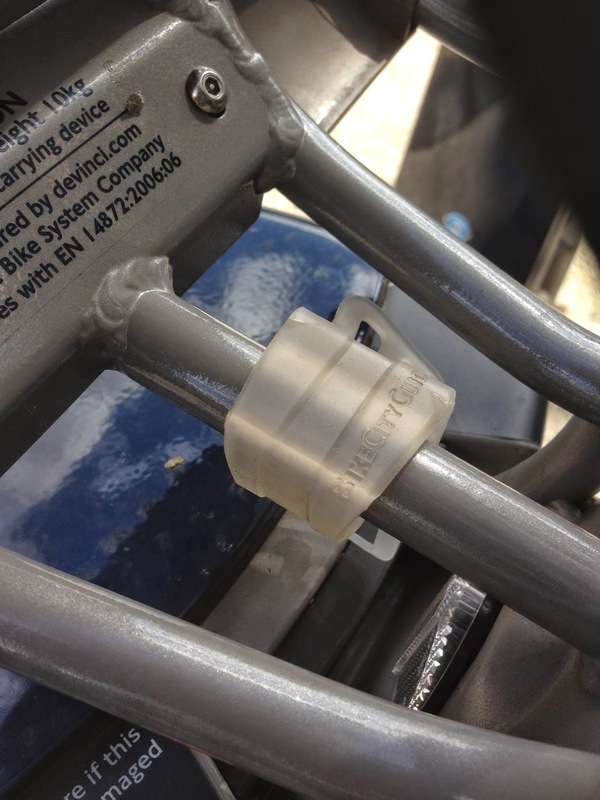 The mount takes just a few seconds to fit/remove - certainly no longer than a single pullover/openapp/check/putaway cycle. If it's raining you can pair the Finn mount with a simple waterproof case such as the pOcpac - which also fits into the Finn mount. I've been using the combo over the winter on handlebars or in a pocket, for long and short on- and off-road rides and cannot fault it. You can purchase the Finn mount for £9.99 from pOcpac here, or pay £17 for the Finn and pOcpac phone case as well in a combo deal that gives you back a whopping 98p to blow on hair product, bike parts or Cake. As the bikes for the London Cycle Hire system are increasingly used worldwide, there's a good chance if you travel the local flavour of hire bike will also fit the Finn mount. Or you'll be able to make it fit. GMaps can work in portrait mode as well, perfect for normal handlebars if there's space.